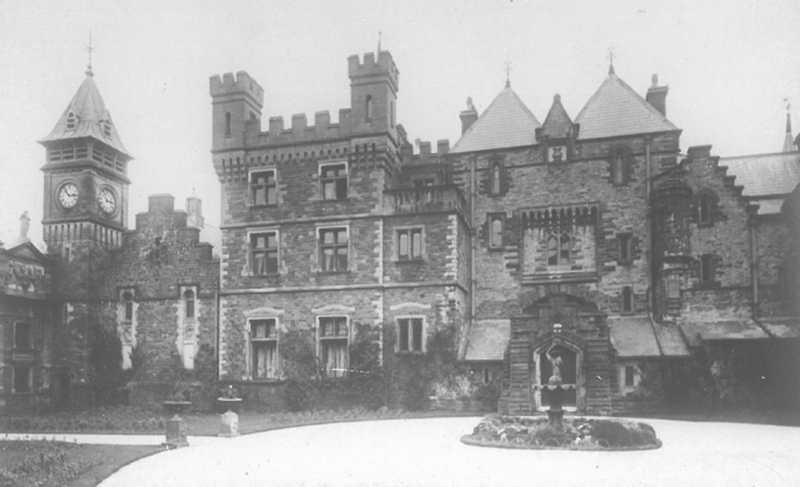 Craig y Nos Castle in the Brecon Beacons - old picture taken probably around 1900. Note the theatre has a different doors arrangement to the present day and of course the front courtyard is laid to gardens. 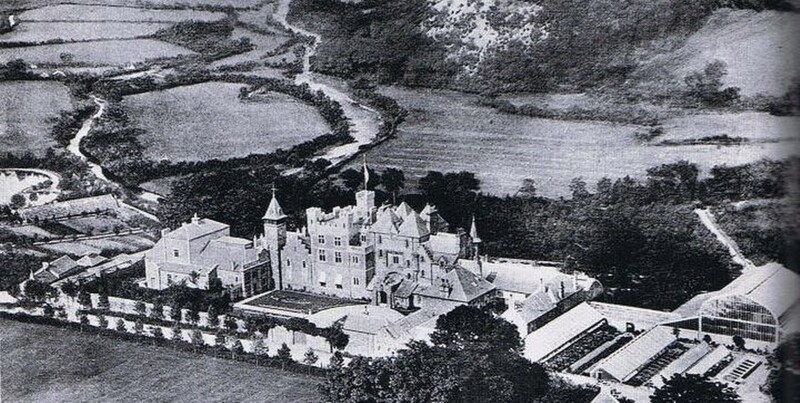 Craig y Nos Castle - this is probably circa 1880 as the theatre is yet to be built. 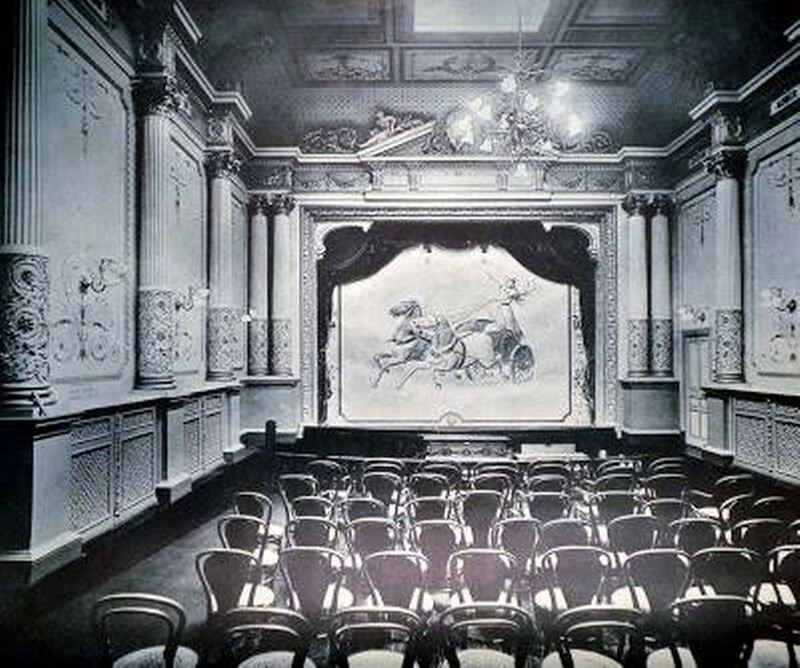 We know the theatre was opened in 1891 so this picture is before then. Note also the Conservatory is not yet fully built, but started life as a series of single storey pitched roof glass buildings. The lower gardens had fewer trees and the terracing is more in evidence. Note also the magnificent steps from the Conservatory terrace to the rear terrace path. This picture is taken from the other side of the River Tawe, from what is now the adjoining Craig y Nos Country Park - now managed by Brecon Beacons National Parks Authority. 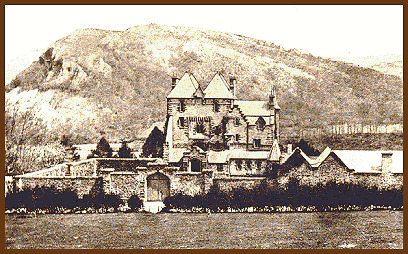 Craig y Nos Castle circa 1880-1885. We know this picture - it may not be a photograph, more likely it is a sketch drawing given photography was not widely available at the time - is of the castle before the Theatre was added. 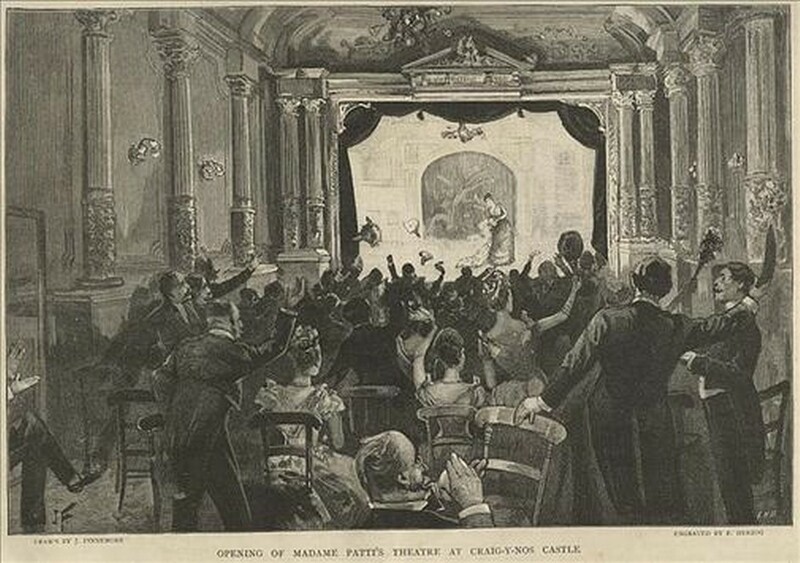 We know the theatre was officially opened in 1891. Building works must have taken a couple of years before then at least, and there is no evidence here of the theatre on the left at all. Note also the pitched roof arrangement with dormer style windows - in place of what is now the castellated section - to the right of the clocktower. Adelina Patti evidently started off with a two storey extension to the left of the original house built by Captain Rice Powell in 1843 (this extension was known as the North Wing). In our opinion, this first extension was nicer and more in keeping with the original architectural design than the eventual three storey castellated and turreted extension we know so well today. Compare this picture with the later ones below showing the castellations. 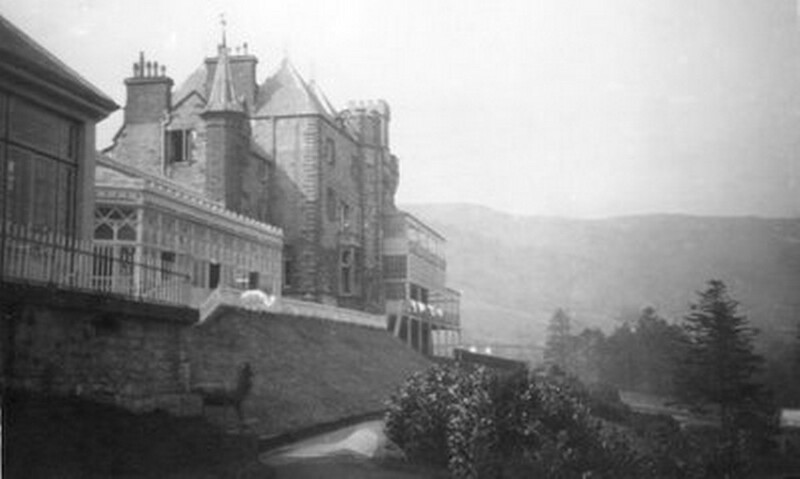 Craig y Nos Castle photographed some time between 1891-1905. Note the front courtyard is laid to gardens and the windows of the theatre are two separate windows one above the other, in place of the current double height windows and glass door arrrangement. Note also how the river Tawe behind the castle splits in two. This shows how Adelina Patti had the river diverted off to the left to feed the lake on the left, which became her boating lake. The short trees in the foreground were until recently still alive, and in recent times they were much larger trees, standing as high as the castle. However they were deemed diseased and were cut down by the Council in 2012. See also the Winter Gardens on the right of the picture. The old Winter Gardens have since been dismantled and moved to Swansea, as Patti bequeathed this part of her home to the people of Swansea. The Winter Gardens now sit on Swansea's seafront, are known as the Patti Pavillion, and currently house the 'Patti Raj' - an Indian Restaurant. Swansea Council recently spent over a million pounds refurbishing the Patti Pavilion, however the original glass roof was long ago replaced by a tin roof. 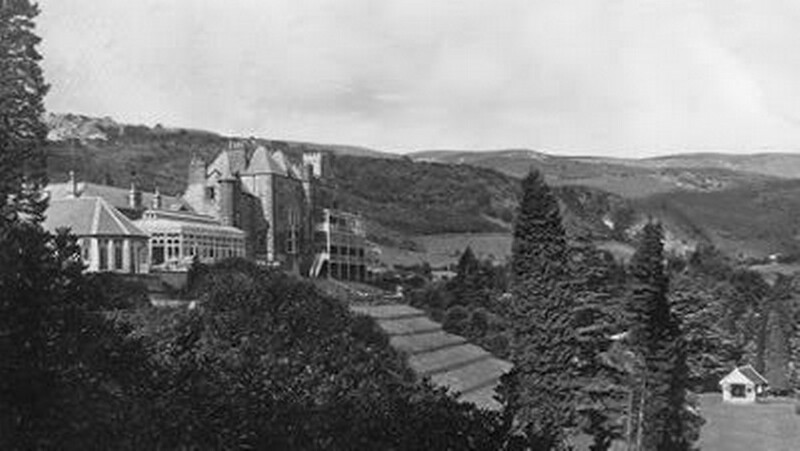 A more recent 1930's photo of Craig y Nos Castle taken from the rear of the castlle. The Conservatory now has a felt covered curved roof, which we suspect dates this picture to circa 1920-30, prior to the Hospital erecting their external balconies for patients to lie out on. This photo could actually be taken after the hospital era, when the balconies were removed. A clue as to its age lies in the presence of the fully intact stone balustrade above the music room (see right side of picture, one building in from the right, to the right of the clocktower 'pyramid'). This stone balustrade is no longer present. We were informed it had been knocked down by the hospital authorities to prevent the stone pieces falling on to people below as it deteriorated. Craig y Nos Castle opera house, an old picture as the chandelier in the centre has not been in situ for decades. 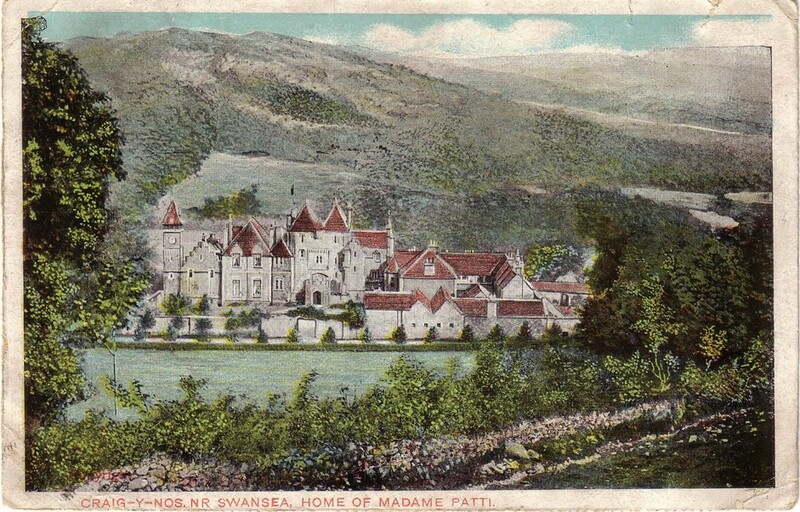 Old postcard of Craig y Nos Castle pre 1891 as the theatre is not yet present and the castellated section has not been added to the 'north wing'. The roof would never have been tiled in red tiles as it has always been a slate roof, so this was a colouring artist's work. 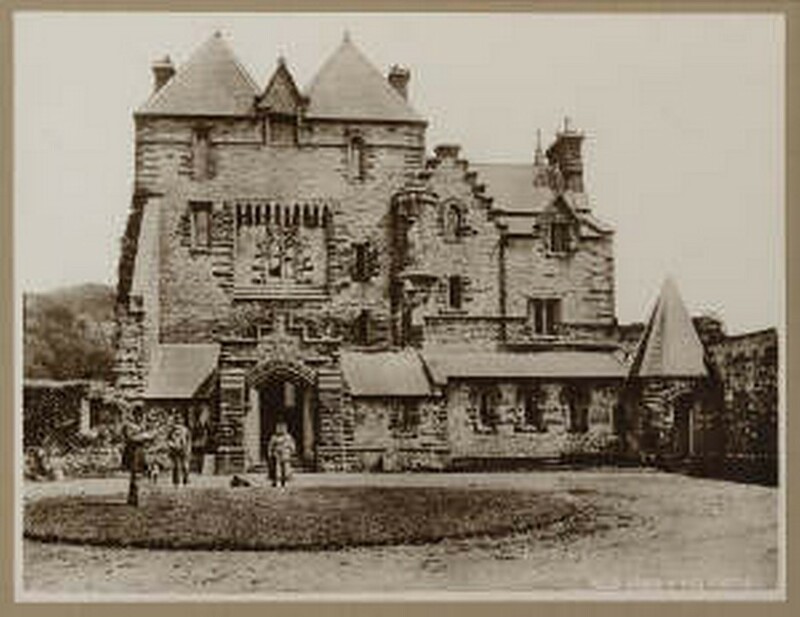 A more recent photograph of Craig y Nos Castle after theatre was added in 1891, probably around 1900. See how the castellations are now in place on the North Wing, and note too how the small trees in front of the castle have continued to develop - they are porbably 10-15 years old in this picture. 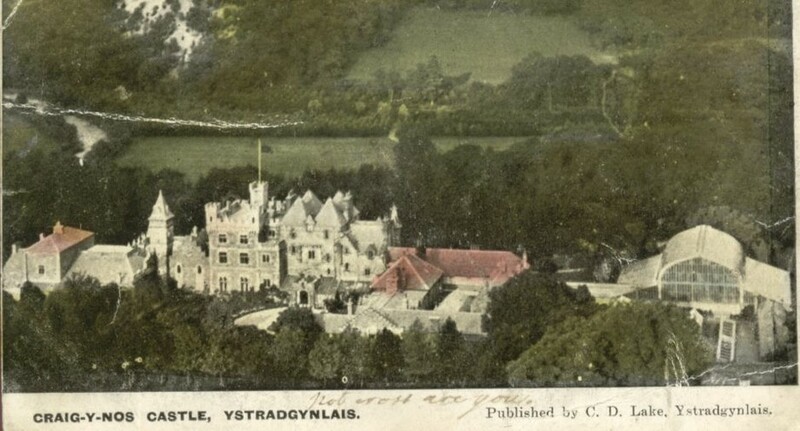 Postcard of Craig y Nos Castle pre 1891 (no theatre again) showing the north wing prior to its castellated third floor being added. 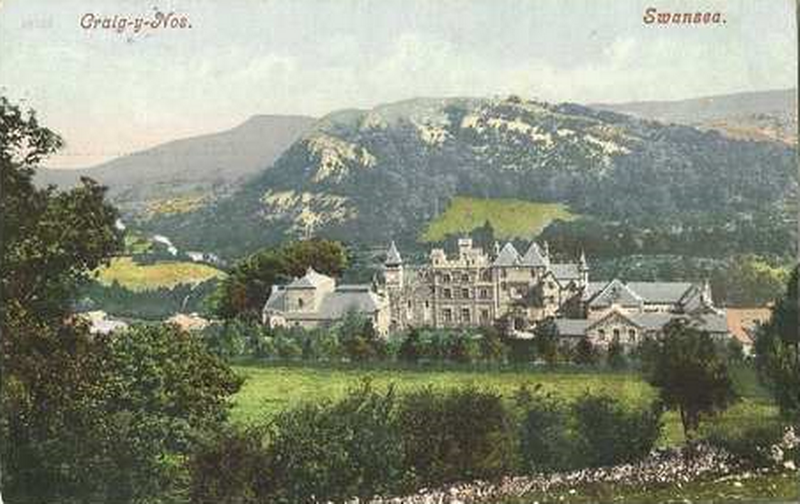 Post 1891 postcard of Craig y Nos Castle, showing the winter gardens (now the Patti Pavilion in Swansea) on the right. The theatre is built and the third floor castellated section has been added to the original two storey building. 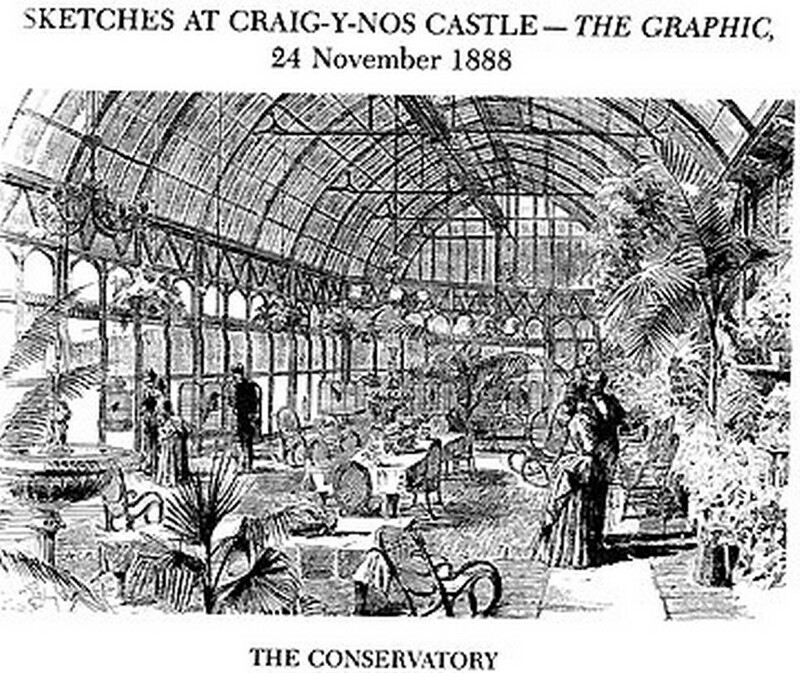 The Conservatory at Craig y Nos Castle, sketched for The Graphic in 1888. Note the impressively tall and substantial looking glass roof. We thought this was artistic licence as in those days sketch artists would make an owner's reception rooms look bigger and more impressive than they were, in order to impress the owner (and the owner's friends and acquaintances) and in order to gain a contract to make more sketches of the rest of the property. So we thought this tall roof was exaggerated until we came across the photo of the same room at around the same period, showing the glass roof to be exactly correct. Later the glass roof was replaced by a wooden domed roof, presumably for ease of maintenance and to reduce the temperature as the all-glass original roof would have made the building very hot in the sun. Nicolini's fabulous Orchestrion in the Billiard Room (now the function room) at Craig y Nos Castle. This was a massive music playing juke box driven by lead weights (though Patti later had hers wired for electricity). 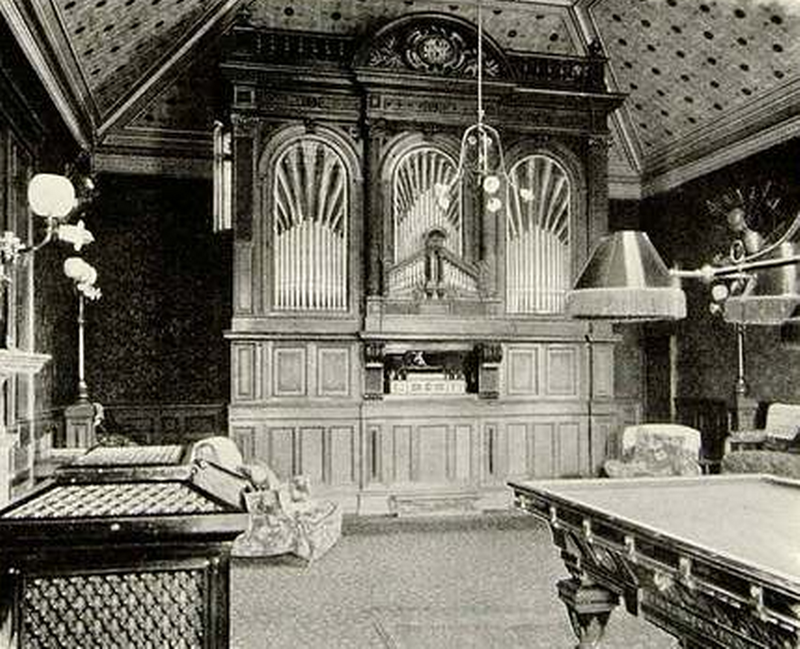 It included 146 pipes, cymbals, drums - everything that would go into an orchestra - hence the name, 'Orchestrion'. It was built to Patti's specification, the largest and best ever built, and is as tall as the ceiling in this very large room. 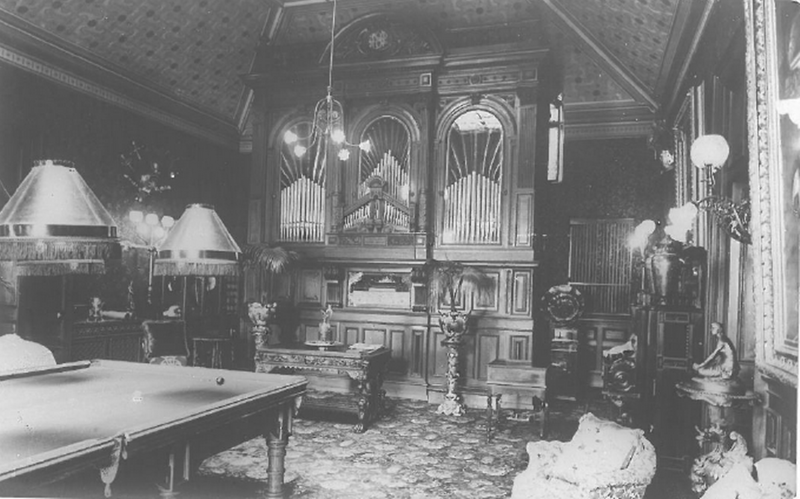 Nicolini's fabulous Orchestrion in the Billiard Room (now the function room) at Craig y Nos Castle. The Orchestrion met a sticky end, which is a shame as it would be worth millions today. Somehow it got exported to the Isle of Man where it ended up in a scouts camp. They were unable to maintain it, and the building in which it was housed leaked, causing the Orchestrion to get flooded and subsequently to rot. Eventually someone was interested enough to switch on the by then degraded electrics wherupon it caught fire. Unable to afford the repairs, the scouts club chopped it up for firewood to use in the camp's heating boiler. 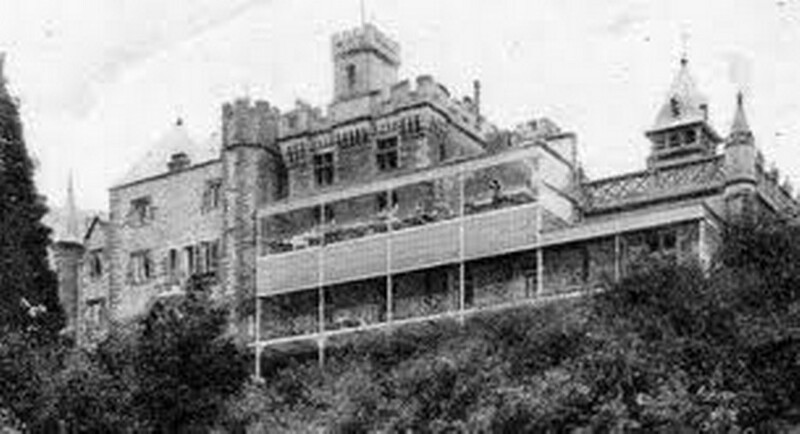 Craig y Nos Castle when it was a TB Hospital with patients on iron framed hospital beds outside for fresh air, on the external terraces. Craig y Nos Castle Conservatory as the Childrens Ward in the TB era, with outside terrace on to which the patients could be wheeled for fresh air. See also to the right, the substantial external terraces, glass sided, but open to the elements on the side facing the Country Park. 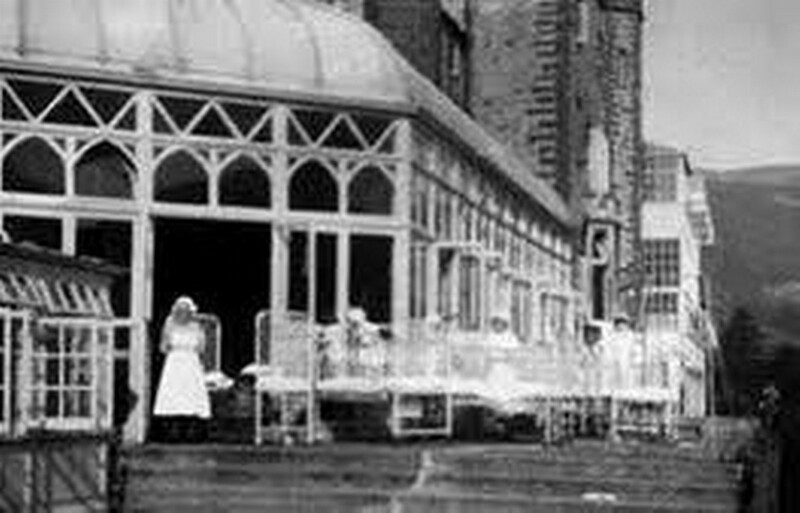 Patients spent all day outside on the terraces in all weathers, and even, it is said, were left out at night. The Historian of 'Most Haunted', Richard Felix, described how the live ones were brought back in the next morning, and the dead ones taken to the hospital morgue. This may or may not be true, but we understand the death rate for TB patients was around 80%, so this might not be so far from fact. 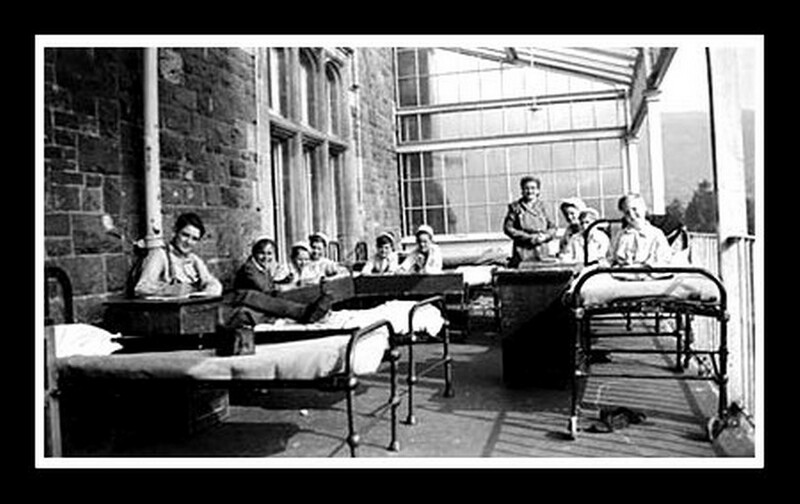 Craig y Nos Castle with patients on the rear terraces in the TB Hospital days. 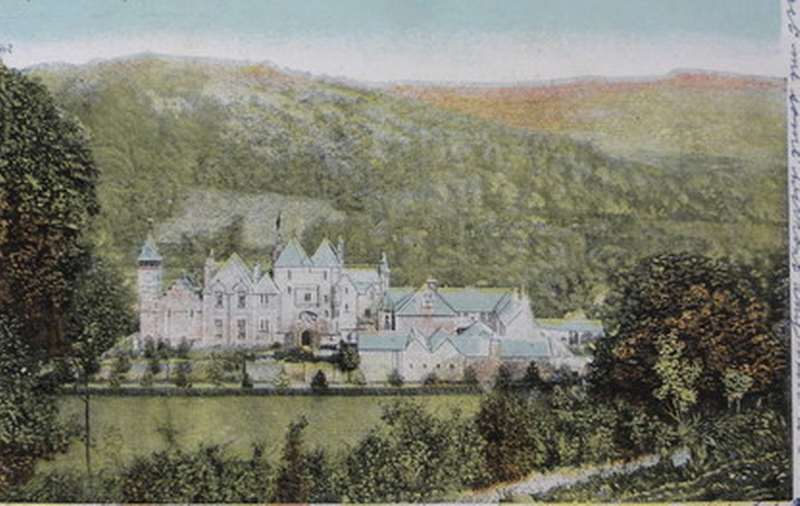 Craig y Nos Castle as a TB Hospital, with State Room Two in use as a second Children's Ward. In the picture shown below we suspect this shows the same room within the Hospital era, but possibly in its later incarnation as a Hospice ward. We know this is State Room Two (the upper of the two identical state rooms) as the lower state room (State Room One) has two iron pillars in the middle of ithe room. We also know that the same room in the Castle's second reincarnation, as an old people's hospice, was subsequently divided into two separate wards of five beds each, with a corridor down the centre, based on markings in the ceiling that remain to this day, where the walls were. 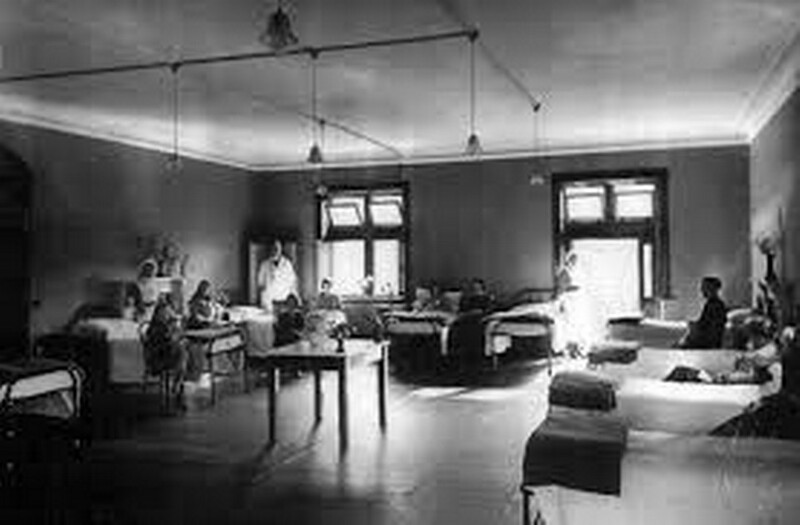 This therefore narrows down the timing of this picture below to either being State Room Two as the Childrens Ward in circa 1920-1950, OR as old People's Hospice early 1950's before its division into two wards. The room dimensions and square shape in the first picture below matches that of the Patti Bar. The double wooden door in the corner (centre-right of picture) is both in the correct place for what we now use as the entrance to the Evening Function room (then the Billiard Room) and also, strikingly, is the exact same design of door as is there now. It may even be the same wooden door we have there now. There are actually two pairs of these doors, one either side of our current 'Patti Bar'. See the two pairs of doors as they are now, viewed from the function room side here. 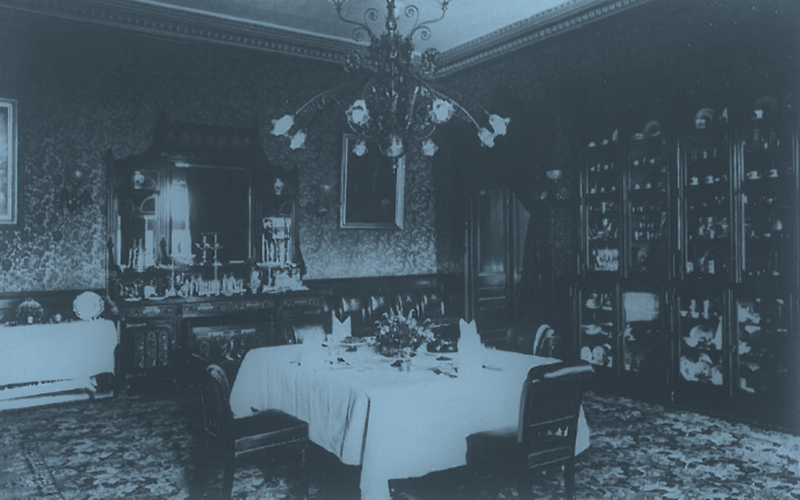 In 1880-1890 we can see today's Patti Bar was in use as a dining room and so must logically be on the ground floor where the Patti Bar is now. This can only be the Patti Bar as it was, as every other ground floor room (Billiard room, Music Room, Nicolini Room and Conservatory) are all accounted for with old pictures for each. The strong possibility that this room is what is now the Patti bar is further suggested by the similarity of the ceiling shape to the bar today, though the small squares of wood or plaster cornicing you see in the old picture are absent now. Why would the ceiling cornicing have been changed to the plainer ceiling there today? Well, we know Adelina Patti started off her 'North extension' (of which the Patti Bar is the ground floor room) with a two storey building with pitched roofs, and later added a third floor and castellated the roof. We can see the upper levels are structurally supported, doubtless on account of the substantial weight of the stone castellations, by an internal iron framework. Today's Patti Bar ceiling is in fact suspended on this iron frame. If you look up, you can see the iron girder running across the centre, with the two large bolts that secure it to the iron pillars in State room 1 above, visible from below. I suspect the extension was substantially rebuilt, with a new iron frame and new girder supporting the centre of the Patti Bar ceiling. We can see the Patti Bar ceiling is suspended on this main girder. The new iron frame added to support the new castellations, will have affected the ground floor level, which must have been rebuilt with the ceiling suspended on the new iron frame. This would have occurred whe the North Wing was changed from the original two-storey extension to the much heavier three-storey structure with castellations we know today. This is hypothetical of course, I am not a builder, but it's the conclusion I have come to after reflecting upon all these historical pictures, on and off, over the last 18 years. There are no doors to what is now our commercial kitchen so they would have been added later, probably in the hospital era. The current Nicolini reception lounge in the era of Adelina Patt's second husband, Ernest Nicolini. 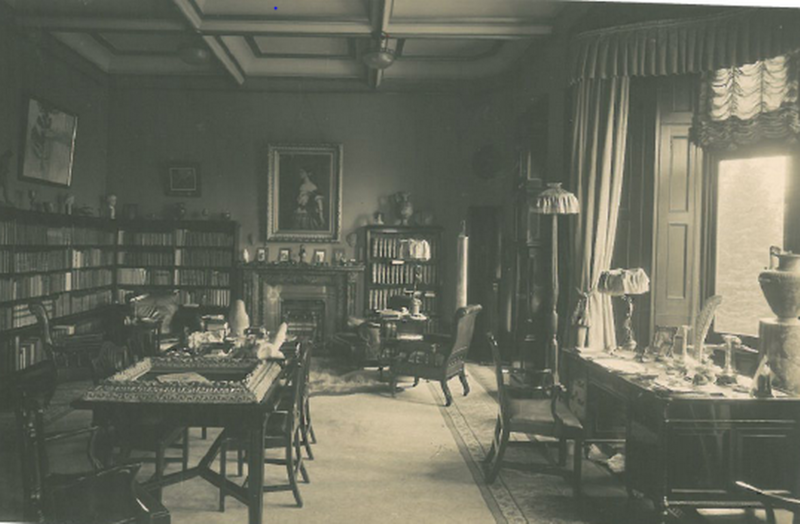 Nicolini used this room as his office and library and would sit at the desk overlooking what is now Craig y Nos Country Park, taking in the fabulous views through the large tall bay windows. There is also a fabulous marble fireplace which would be very nice to have back again! Bookshelves line the walls. The ceiling squares were in place when we arrived in 2000, but leaks from the pyramid gulleys on the top of the castle had caused all the joists to rot and we had to replace the ceiling. We have since reinstated the fireplace and a log burning stove now heats this room most efficiently. The picture of Patti on the wall above the fireplace has been reproduced (minus the fancy frame) as the original has long gone, and it now sits in the function room. 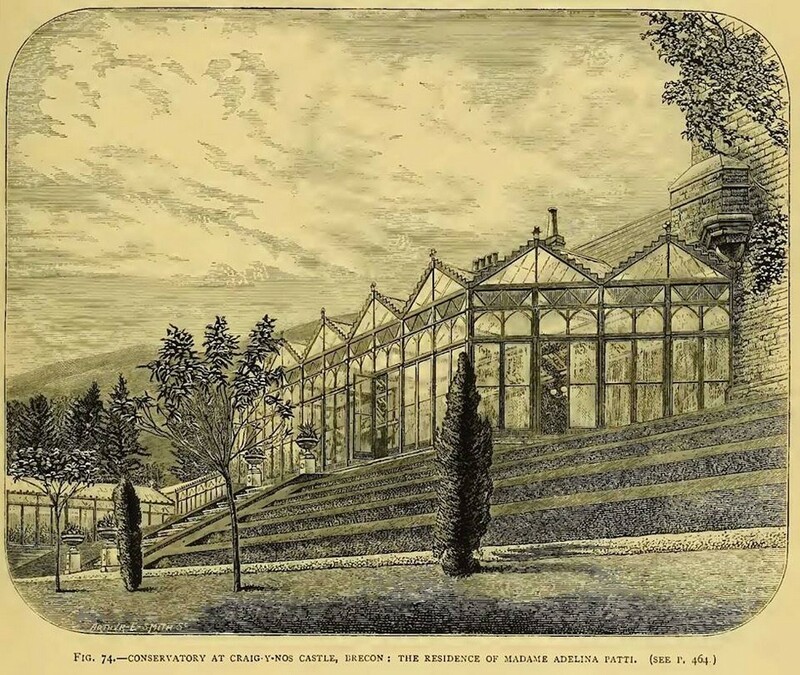 The Conservatory at Craig y Nos Castle before the Castle became a TB hospital (judging by the lack of any hospital terraces). The roof of the conservatory is in its current domed shape, however it probably had a lead roof at this time in place of the current fibreglass. The castellated border edging is interesting. It was long gone when we arrived in 2000. We had to replace all the windows but modelled the replacement windows on the exact design of the original. I rather like castellated border arrangement and if money was no object we would replicate it for historical accuracy. We have continuing problems with the roof leaking, probably due to the wooden roof expanding and contracting in different temperatures, causing the fibreglass membrane to develop invisible cracks. 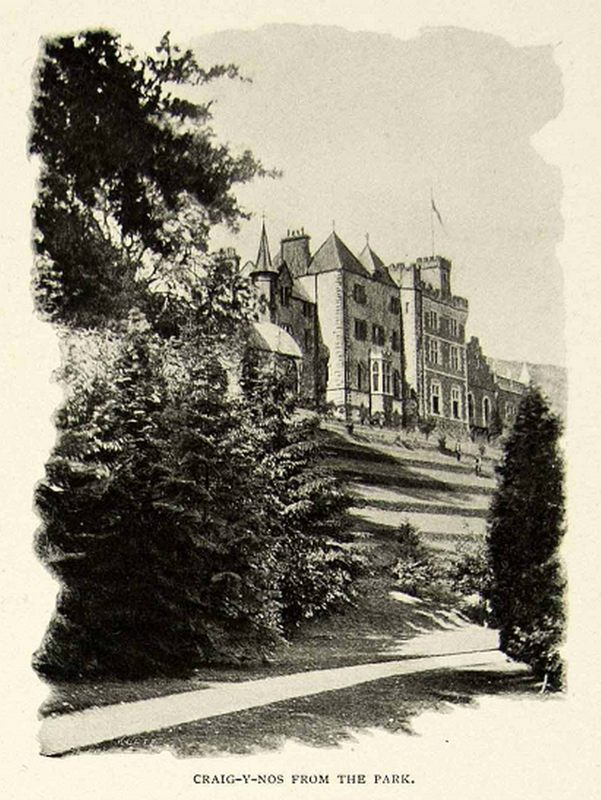 Rear aspect of Craig y Nos Castle in Adelina Patti's era, pre 1920. Rear of Craig y Nos Castle, probably in the 1940's. See the rear terraces dating back to the TB Hospital time at the back of the castle on the right. There is evidence of patients bedding or sheets on the balcony railings. Note how the Conservatory still retains its roof topping of castellations, while the lantern roof arrangement can just be made out on the domed roof. The building on the left foreground is the 1940's/ 1950's era hospital addition, the old 'South Ward' and 'North Ward'. We used these buildings as a call centre for a few years, but now these more modern rooms are used as storage. 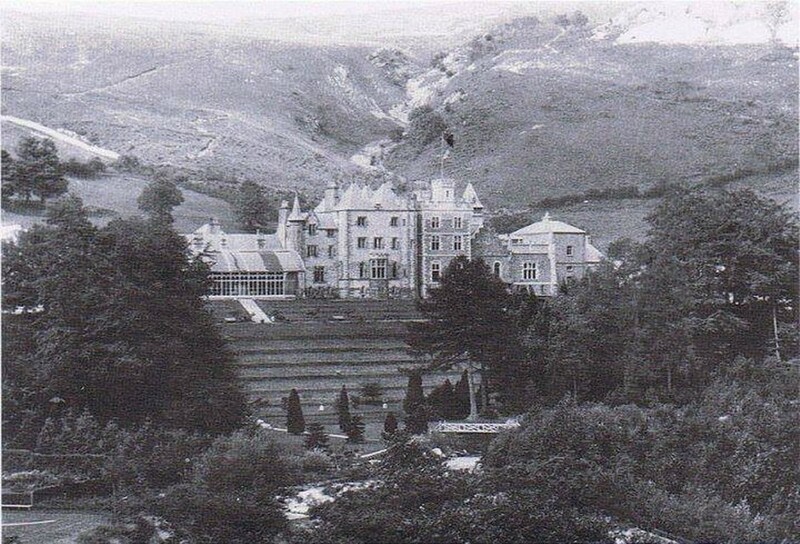 Similar aspect of the rear of Craig y Nos Castle to the picture above, and a similar time - probably 1950's. 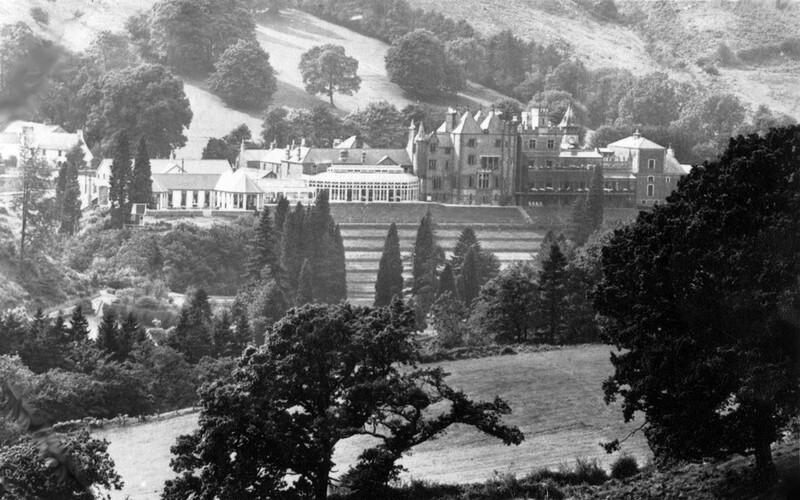 On this very clear picture of Craig y Nos Castle taken in the 1950's or 1960's, we can clearly see the white sheeted hospital beds of the patients out on the rear terraces behind the castle to the right of this picture. The left of the picture shows the hospital additions, the old South and North Wards. The Conservatory's former 'lantern roof' can be seen quite clearly in this picture. The Lantern Roof was a raised structure in the centre of the existing roof with windows around the sides to let light into the Conservatory from above. It has long gone of course, and there is now a flat roof in its place. 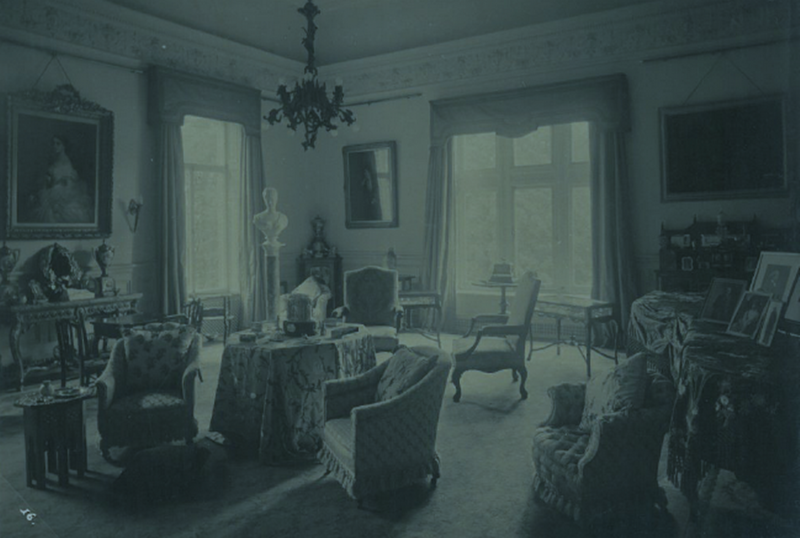 The Music Room at Craig y Nos Castle circa 1900-10, in use as Adelina Patti's sitting room. The ceiling cornicing is as it is now, though we had to replicate one corner of it when it fell down due to damp ingress. This room would have been added after the theatre was built, probably around the turn of the century. 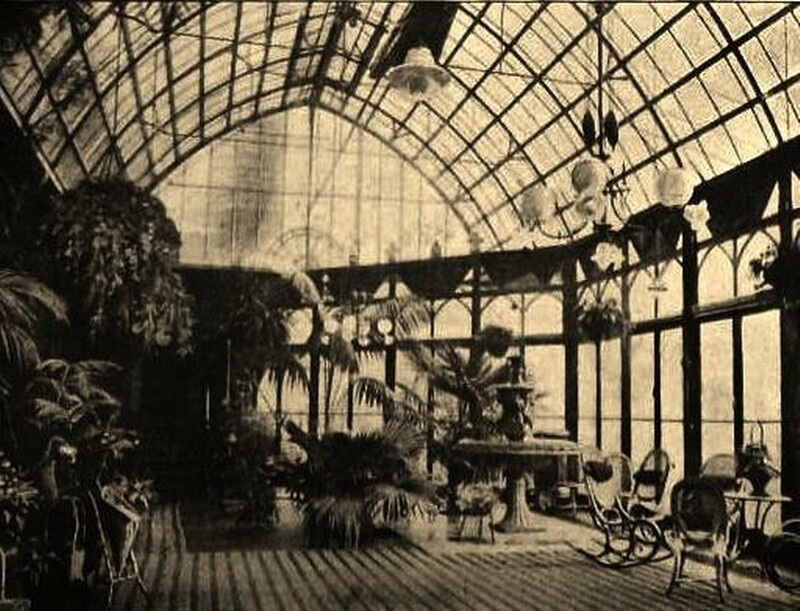 The Conservatory with its impressively huge glass roof, subsequently replaced with a lower domed roof made out of wood and supported on iron struts. This photography must have been taken some time around 1890-1900. Glass in those days was expensive and Patti would have spent substantial amounts of her money building a load of rooms in glass - the Conservatory, the Aviary and the Winter Gardens were all glass buildings running along the back of the castle. The lower section of windows can still be seen in the modern day conservatory, as we replicated the design exactly when we replaced all the windows. Judging by the ferns this would have been a very warm room in the summer though I doubt it was that efficient to heat in the winter. Patti would not have had 60 kilowatt underfloor heating as we have now. 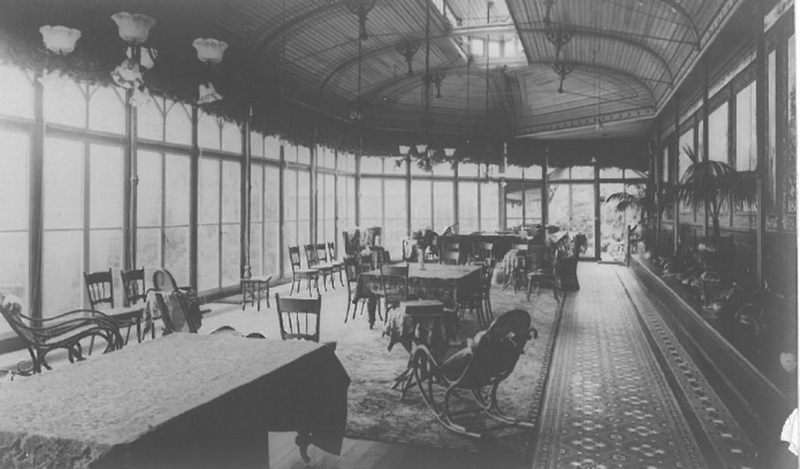 And here we see the Conservatory in its later incarnation, circa 1910-1920, when it was probably used as a summer dining room. The expansive glass roof has been replaced with a curved wooden roof, rather like an upside down boat, with the Lantern roof down the centre to let in some light from above. See the Victorian iron arches which are still in existence today, though these and the wooden ceiling is now hidden by a white canopy. In Patti's day the wodden roof was painted white and would have looked quite striking against the black ironwork of the roof struts. The lantern section has since been replaced by a flat section of roof. Here we see the same room, Craig y Nos Castle's Conservatory, in use as a Children's Ward in the TB Hospital days. We think this picture is circa 1940, judging by the presence of the North Ward buildings which I think we can see through the far windows. 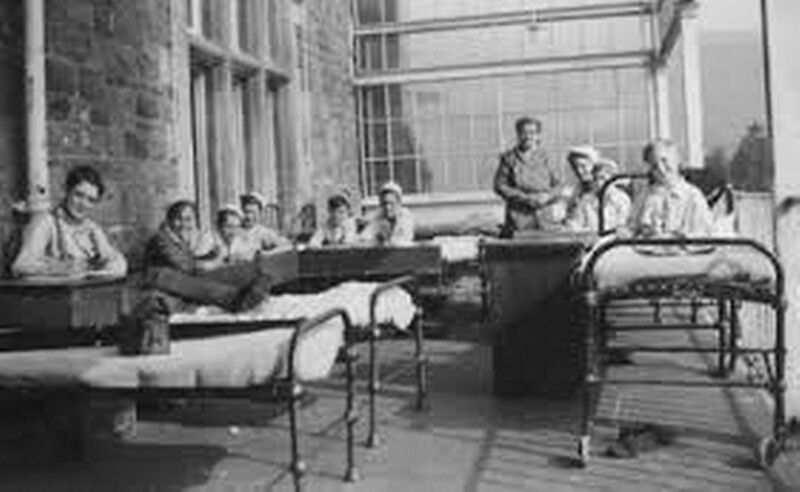 There were 18 small iron beds with iron sides, for the children, as the Conservatory was in use as the main Childrens Ward. There was also another Children's ward on the top floor of the castle in State Room Two. 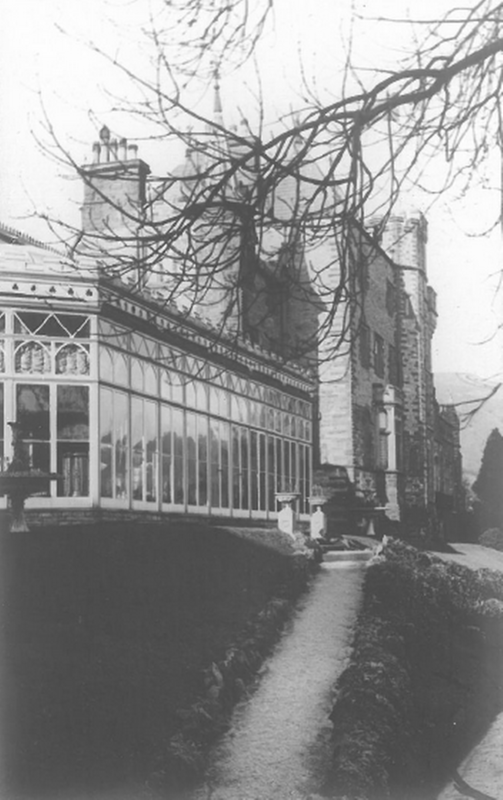 The Conservatory at Craig y Nos Castle in its first incarnation, circa 1880-1890, with a more conservative glass roof based on a series of seven or eight lower pitched glass roofs. The glass windows are exactly as they are now, though as stated earlier, we had to replace them as they were rotten (and mostly removed in the Hospital era). What we put back is in the same design as the original as you can see from this very early print. This is a sketch rather than a photograph, as the time predates photography. Not only is the roof most interesting, showing us how the Conservatory was first conceived, but also there are some interesting stone walled terraces directly below the conservatory. The latter may be artistic licence as we today only see sloping earth banks. Allternatively this may even be an architects sketch showing what was intended in the planning stage. Also, on the left, you can see an early version of what later became the Winter Gardens (now the Pattii Pavilion in Swansea). Clearly this early version was knocked down and replaced by the building that is now in Swansea.